Lightbar brilliance in a flashlight body! The Flashback Five™ Light Baton can be used as a signal..
Our LED Traffic Baton with Flashlight is exactly that. It's a magnetic traffic baton (red color) ..
100% Lightweight mesh polyester Velcro® breakaway closures on shoulders, sides, a..
100% Polyester PU coated breath.. 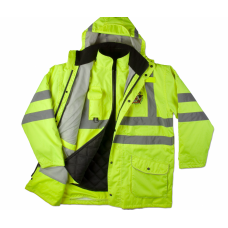 Outer Shell: 100% polyester 300 denier oxford PU coated heavy duty fabric Lining: Black..
12oz 100% spun polyester fleece Meets ANSI/ISEA 107-2010 Class 2 and background color s..
100% Lightweight polyester Meets ANSI/ISEA 207-2006 Class 3 standards 2" Vizlite™..
TOP SELLER Heavyweight Taslan outer shell Coated for wind and water-resistanc..
100% Breathable Polyester Oxford Wind and water resistant Black non-pill fl..
100% polyester jersey knit polo with tapered collar Meets ANSI/ISEA 107-2008 Clas..
12oz. 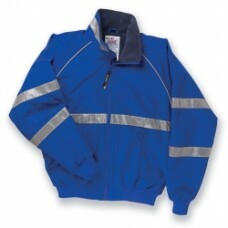 Spun polyester fleece, feels like soft cotton Meets ANSI/ISEA 107-2010 Class 3 an..
12oz. 100% Spun polyester fleece, feels like soft cotton Meets ANSI/ISEA 107-2010 Class..
100% Breathable Polyester Oxford (100% Black nylon Oxford) Wind and water resistant ..
Heavyweight polyester, wind and water resistant Black non-pill fleece lining 2" S..